I started pulling out a few of the features in FTP On The Go since put together, they really make an entire very useful program. 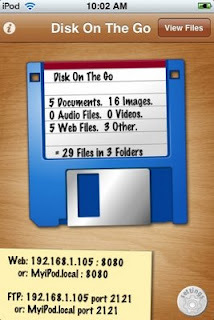 The Web and FTP servers, along with the directory manager to browse your files, and the viewers for individual files (editor for text, etc) all add up into a very useful program. Crazy that I could have stopped after the first day of work and called it done. But I wanted to add a much cooler interface...the picture here doesn't show how cool the "bounce" sizing looks when you touch the things on the screen. About a week later and it's all done and submitted to Apple. Even a website using Peter's nice templates: WiFi Disk. Hopefully shows up in the AppStore soon!